A dehumidification system has been set up at Coleytown Middle School to address the school's ongoing issues with mold growth. WESTPORT — Just four days after saying she saw no reason to shutter Coleytown Middle School, Superintendent Colleen Palmer tweeted Thursday night that perhaps students should be relocated. At a school board meeting Monday night featuring a parental uprising regarding concerns over the school’s ongoing mold problem, Palmer said she saw no reason to close the aging Coleytown. However, she reversed herself in a Thursday night tweet calling for a plan to relocate students to two other Westport school facilities. “At a special (Board of Education) meeting today, I proposed moving (Coleytown Middle School) grades 6 & 7 to (Bedford Middle School), grade 8 to (Staples High School) while the District takes the next month to conduct an in-depth assessment of the CMS environmental concerns. If approved by BoE, CMS students would have partial day on Monday, full day Tues.,” she tweeted. Palmer followed up the tweet with an email to parents better explaining the situation. Starting Monday, Coleytown sixth- and seventh-grade students will be placed at Westport’s other middle school, Bedford Middle School, with Coleytown eighth-graders moved to a special wing of Staples High School, Palmer wrote in the email, nothing the relocation will take place, “during this next month or so,” concurrent with the air quality assessment. Mold, an ongoing issue at Coleytown Middle School, was first identified at the school in August 2016, at which point school officials estimated the work would be complete by the end of the calendar year. Instead it took until May 2018 to address all of Coleytown’s identified mold concerns. 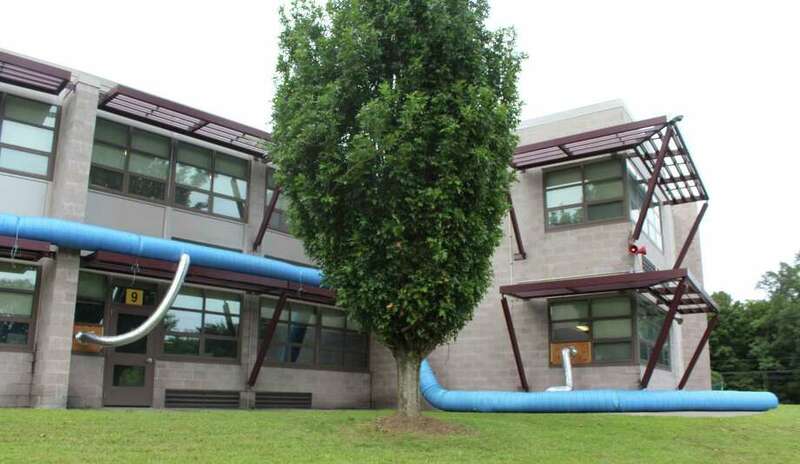 Over the summer, however, a failure of the school’s air circulation coupled with hot and humid weather caused mold to resurface at the school and led to more than half the school needing remediation, which was completed just days before the first day of school on Aug. 28, Palmer said. In order to decrease the humidity levels inside Coleytown, which Palmer said reached 85 percent and higher over the summer, and thus prevent mold growth, school administrators placed large industrial dehumidifiers outside of Coleytown before the start of school and kept the dehumidifiers in place throughout the first few weeks of school. Last Friday, part of a dehumidifier outside the Coleytown eighth-grade wing failed and caused a burning mechanical odor to spread throughout the building, Palmer said. The mechanical failure was repaired, but the following Monday morning several staff members reported shortness of breath and dizziness, and the building was evacuated for a half hour in order for fire department officials to check for potential carbon monoxide contamination, Palmer said. Dozens of parents reprimanded Palmer and her team at the Board of Education meeting Monday night and at a separate Coleytown parent Q&A session Thursday night saying they were not given timely notice of the evacuation and why it occurred. Throughout the past two years, Palmer has not provided transparent information about the school’s mold issue and failed to remediate the issue quickly, parents said. Many parents noted their kids have been sick the last few weeks since school started and feared the sickness was caused by the mold. On Tuesday morning, the day after the evacuation and the night following the first parent uproar, the number of absent students exceeded 50 students, which is double the typical rate, Palmer said. The number of absences at Coleytown prior to that date was normal and tracked with previous years, Westport Public Schools Supervisor of Health Services Suzanne Levasseur said. Meanwhile, Westport Weston Health Director Mark Cooper, who has been advising Palmer on the Coleytown mold problem, said he didn’t recommend or see the need for Palmer to close the school, noting many of the students’ symptoms — scratchy eyes and dry throat — may be caused by the dry air the dehumidifiers were blowing into the building to lower the humidity levels. Many students get sick when they return to school for the year because they are exposed to germs from other students, Cooper added. Cooper will present a report about Coleytown’s environmental assessment at a special meeting of the Westport Weston Health District Board of Directors at 7:30 p.m. Monday night in the Health District Conference Room, 180 Bayberry Lane.